If you’ve watched baseball long enough, you know a team’s fortune can change, and often quickly. On the field, circumstances can alter in a matter of seconds. A team can be holding on to a two-run lead in the bottom of the ninth, and with one swing of the bat find itself losing the game. A player can be healthy one moment and writhing on the ground in agony the next. One year a team is on top of the world, players raising the World Series trophy and spraying champagne in their locker room. And then, just a year later, that same team can find itself in the cellar. For other teams, long runs of success are met with slower, more winding declines. The dynastic, bombastic, fantastic swinging A’s of the 1970’s featured the likes of Reggie Jackson, Rollie Fingers and Catfish Hunter. From 1971 through 1975, they appeared in five American League Championship Series and won three World Series titles in a row (1972-1974). Their decline began in 1976, when they finished second in the American League West with an 87-74 record. They then took a precipitous dive to last place in 1977. The A’s lost some players from their championship run, and it showed in their play. They finished that abysmal ‘77 season with a 63-98 record. The 1978 campaign was more of the same, though they managed to finish sixth, ahead of the upstart Seattle Mariners, who were in only their second year of existence. By 1979, the A’s were putrid. Owner Charlie Finley had sold all of his marquee players, and at one point even wanted to sell the team to buyers who wished to move it out of Oakland. And no one wanted to watch them play. They sold only 653 tickets to a mid-April game against the Mariners. 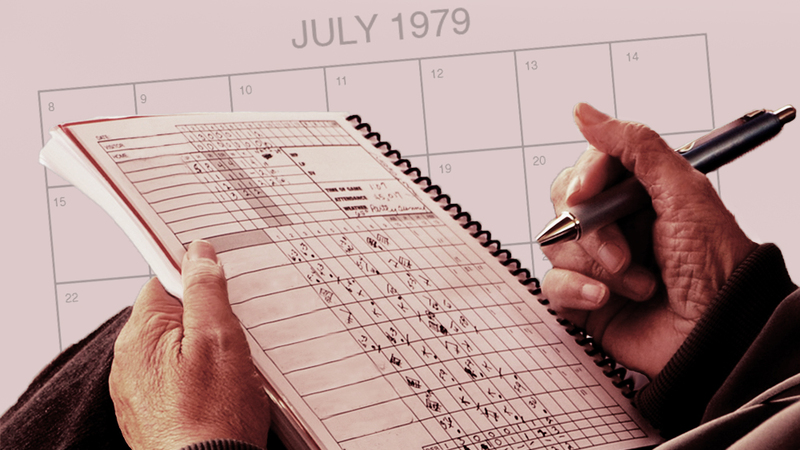 Our game took place a few months later, on Tuesday, July 10, 1979. On that day, “Ring My Bell” by Anita Ward was the No. 1 song on the Billboard charts. Moonraker, the 11th entry in the James Bond franchise, was a popular choice at movie theaters. And sports lovers were a mere two months away from the debut of ESPN. Just two days after this game, the Chicago White Sox hosted Disco Demolition Night during a doubleheader, which was a mistake in hindsight. In the break between the two games, fans stormed the field, destroying it and causing mayhem throughout the stadium. The White Sox were forced to forfeit the second game. A week later, on July 17, the National League won its eighth straight All-Star Game, 7-6. And two weeks later, on July 24, Carl Yastrzemski hit his 400th home run, off Mike Morgan of these same A’s, in a 7-3 Boston win at Fenway Park. The managers were Earl Weaver and Jim Marshall. The umpires that night were Rich Garcia at home, Larry Barnett at first, Jim Evans at second and Ed Spenn at third. On this night, the Orioles and A’s possessed opposite fortunes. Baltimore was nearly 30 games above .500 and well on its way to a division title, while Oakland was already 40 games under .500 and mired in last place in the AL West. The other critical component of this box score was the attendance total. It wasn’t as bad as that game in April, but 1,880 is not the kind of number you want to see on a summer night in the heart of the season. It was a cool 65 degrees at game time, and Oakland starter Rick Langford got things going by setting down the first three Baltimore batters in order in the first. He struck out leadoff hitter Al Bumbry and No. 2 hitter Kiko Garcia, while inducing a flyball out from Ken Singleton. In the bottom of the inning, visiting starting pitcher Steve Stone wasn’t as lucky. Things looked good at first for Stone, as he got rookie Rickey Henderson and Dave Chalk to ground into two quick outs. But after that, he gave up four straight singles to Wayne Gross, Mitchell Page, Jim Essian, and Mike Heath to put the A’s up, 2-0. The small crowd had something to cheer about. Stone finally got out of the inning by getting Jeff Newman to ground out to short. In the second, Langford once again set down the O’s in order. Stone rebounded for a much better inning. He gave up a leadoff single to Tony Armas but got Rob Piccolo to line out to short, and induced both Henderson and Chalk to fly out to right to end the inning. It was more of the same for Langford in the third and the fourth. He was in a groove, and the Orioles couldn’t get anything going against him. This stood in contrast to Stone, who gave up a solo shot to Essian in the bottom of the third, giving the A’s a 3-0 lead. The bottom fell out for Langford in the top of the fifth. It started with a single to Murray, which was followed by a walk to Lowenstein. DeCinces drove in the first Orioles run with a single that scored Murray from second and moved Lowenstein to second base. Next, Roenicke hit a ground ball to third; Lowenstein was forced out, and DeCinces made it to second. Langford had runners on first and second with one out. The next batter, second baseman Rich Dauer, hit a ground ball to shortstop that Rob Piccolo mishandled, loading the bases. Langford was in a real pickle. Rick Dempsey hit a sac ball to right that scored DeCinces and pulled the O’s a run closer, 3-2. Al Bumbry, the next batter, hit an RBI single. Langford struck out Kiko Garcia to end the inning, but the damage was done. Langford gave up the lead, and the game was tied, 3-3. Stone threw his second straight 1-2-3 inning in the bottom of the fifth, and Langford came back out for the top of the sixth. He immediately gave up back-to-back doubles to Singleton and Murray, and the O’s got their first lead of the day, 4-3. Then Lowenstein hit a two-run home run and gave the Orioles a three-run advantage. At this point, you would think A’s manager Jim Marshall would yank his starter from the game, but he didn’t. Langford got himself into this mess, and he’d have to get himself out of it. He worked around a Roenicke single, aided by Roenicke attempting to steal second. Catcher Jeff Newman gunned him down, and Rich Dauer grounded out to finally end the inning. The Orioles were now ahead, 6-3. In the bottom of the sixth, it looked as if Stone was well on his way to his third straight 1-2-3 inning after striking out Essian and getting Heath to ground out. But Newman took Stone deep and the A’s got a run back making it, 6-4. They were putting up a bit of a fight, but Stone recovered quickly and struck out Tony Armas to end the inning. Guess who came out to pitch the top of the seventh inning? Langford. He worked around a Kiko Garcia double, as the O’s left Garcia on base. In the bottom of the seventh, Mike Edwards pinch hit for Piccolo. Edwards hit a single but tried to stretch it into a double and was called out at second. He would be Stone’s last batter. Weaver called upon Sammy Stewart to finish the bottom of the seventh. Henderson grounded out, both Chalk and Gross walked, and Mitchell Page lined out to end the inning. Langford would face the middle of the Orioles order in the top of the eighth. Murray and Lowenstein hit back-to-back singles to start the inning, but A’s manager Marshall remained glued to his seat in the dugout, or at least that’s what I’m picturing. Langford induced a pop fly to short by DeCinces that didn’t move the runners, and he got Roenicke to ground into a double play to end the inning. No damage was done. Marshall knew what he was doing, or got to act like he did. If the sparse crowd didn’t leave after the Orioles took their three-run lead in the sixth, they were treated to a fun and somewhat unlikely bottom of the eighth. With the Orioles up, 6-4, their reliever Stewart remained in the game to pitch the bottom of the eighth, and he hit Essian with a pitch to start things off. Mike Heath hit a grounder to third base for the first out, advancing Essian to second. Stewart then hit Newman with a pitch and put runners on the first and second with only one out, and Armas coming up to bat. Pinch runner Larry Murray replaced Newman before Armas smacked a double to right field that scored Essian, and the A’s were down only a run, 6-5. Weaver brought in reliever Tippy Martinez to replace Stewart. It was Martinez’s job to keep the A’s from tying the game, but Edwards hit an RBI single to left that knotted the score at six. Next, Henderson hit a sacrifice fly to right and it seems, from the box score, Edwards may have strayed too far off first and got caught in a rundown. But it also seems he was in that rundown between first and second long enough for Armas to score. It’s marked in the play-by-play of the game as Henderson sacrifice flied into a double play (Double play: Flyball: RF-1B-2B/Sacrifice Fly/Armas Scores). Got all that? So the A’s pulled off a comeback and went ahead, 7-6. In a move that won’t shock anyone, Langford started the ninth and got pinch-hitter Pat Kelly to fly out to left for the first out of the inning. Next, Terry Crowley pinch hit for Rick Dempsey, hit a single to center and was replaced by pinch runner Wayne Krenchicki. With Krenchicki on first, Bumbry hit a single to left. A’s manager Marshall stood up, walked out of the dugout, signaled to his bullpen and took Langford out of the game. Reliever Dave Heaverlo came in, and with runners on first and second and only one out, got Garcia to hit a pop fly to second before striking out Ken Singleton to end the game. The lowly Oakland Athletics defeated the mighty Baltimore Orioles on a cool Tuesday evening in July of 1979 in front of only 1,880 people, and those who stuck around until the end got their money’s worth. They were treated to a seesaw game that included a couple of lead changes and an exciting eighth-inning comeback by the home team to capture the win. The 1979 squad remains one of the worst in the A’s 118-year franchise history, but there was at least one bright spot that year. Hall of Famer Rickey Henderson, whose fly ball helped win this game, made his major league debut a few weeks earlier on June 24, and in four at-bats that night had two hits and a stolen base. It was a glimpse of things to come. As for Rick Langford, if you think he pitched a lot in this game, it was nothing compared to his 1980 season. He was part of Billy Martin’s 1980 campaign of iron man pitchers. Langford pitched 28 complete games and had a streak of 22 in a row that lasted from May 23 to September 17, leading a staff that would throw 94 complete games that year. On September 17, he pitched 8.2 innings. Langford finished the season with three more complete games, and he pitched 10 innings in a 15-inning loss to the Brewers. He compiled 280 innings in 1980. Oakland fans didn’t have to wait too long for their team to make it back into the playoffs. They finished 64-45 during the strike-shortened 1981 season, which was good enough for first place in the AL West, and once again advanced to the American League Championship Series. They were swept in three games by the New York Yankees. Stacey Gotsulias is a freelance writer whose work has appeared on ESPN.com, USA Today online and FanRag Sports. She currently writes for Baseball Prospectus and is an author of The Hardball Times. Follow her on Twitter @StaceGots. Thanks for this… I was living in Colorado at the time (age 8), eagerly awaiting the move of the A’s to Denver. Wonder how that alternative timeline would’ve worked out. Loved this read. How do you pick these? So amazing that Henderson debuted on one of the worst A’s squads ever. It’s really unfortunate Mitchell Page faded quickly after his rookie season of 1977. There were conditioning issues, and Page just didn’t take of himself. I think a player can be solid one minute and be squirming on the ground in misery the following. One year a group is large and in charge, players raising the World Series trophy and splashing champagne in their locker room. And afterward, only a year later, that same group can end up in the cellar. However, I actually want to have content about rush paper but this is good article about random box score.